Recall at the beginning of this chapter, we said that there were 4 parts to Module Styling. 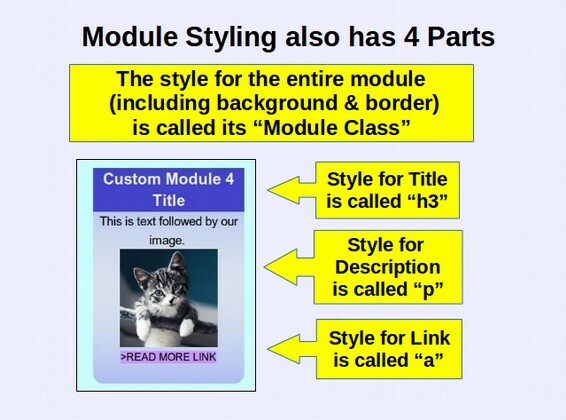 These are the Module Class (including background and border styling), title “h3” styling, description “p” styling and link a styling. Thus far, we have simply styled the h3 and p tags. Before we put all of the styles together, we will quickly review how to create CSS for our link tags. Links are styled using the “a” and “a hover” tags. The technical name for links is called buttons. Joomla has a one click tool for adding a READ MORE link to any Joomla article. But it does not offer this tool to add a READ MORE link to a Joomla module. The reason there is not a READ MORE button function in a Joomla Module Edit screen is because the module would not know what to link the Module to. The above Demo button uses a gradient background that changes color when we hover over it. To keep things simple, we will use a plain dark background that does not change color when we hover over it. 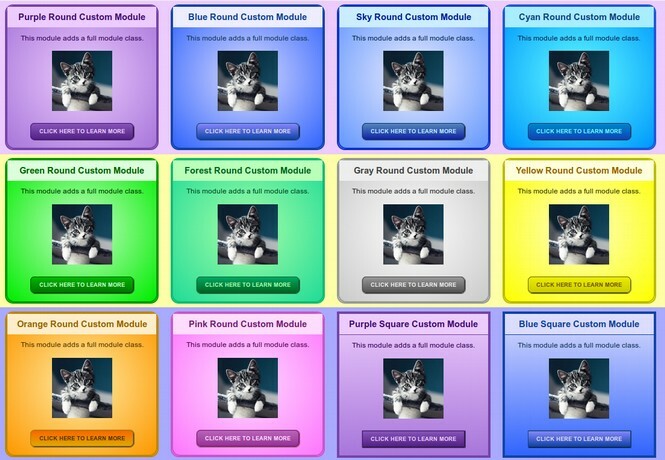 Designing a button is like designing a miniature version of an entire module. We need to specify several properties. We will create 10 different buttons to match our 10 Rainbow module classes. We will also reverse the colors to make our button more distinctive. In other words, we will use light colored text on a dark background. Below is a table of values for our 10 Rainbow button color settings. The only difference between the 10 round and 10 square buttons is that the round buttons have a border radius of 20 pixels and the square buttons have a border radius of 0 pixels. We will use CLICK HERE TO LEARN MORE! for our text. We will make each button bold Arial and a light color from the table above. Make the Shadow color the same as the text color make it more readable. Then click on the Button tab. The Shadow color sets the border shadow. We will set all Shadows to black with a thickness of 1 pixel. Leave the padding set for 10 top and bottom and reduce it from 25 to 20 left and right. Then click on the Border tab. We will set this at Solid and increase the radius from 10 to 20. Next click on the Background tab. Use a lighter color for the background and the same light color at the start and a darker color to finish. This is the blue button. Click on the Hover tab. Change the hover text color to #ddddee to match the normal text color. Then reverse the gradient colors on hover. Type in the colors. Then copy the code to a button code document on your home computer. Note that we have only one class above that needs to be added to our module Advanced tab. It is called simpleroundblue. The first section styles the entire module. The second section styles the h3 header box. The third section styles the “p” text box. Then the final two sections style the button. Here is a more complex version of the above module with a radial gradient color for the module background and a different gradient color for the button and button hover. 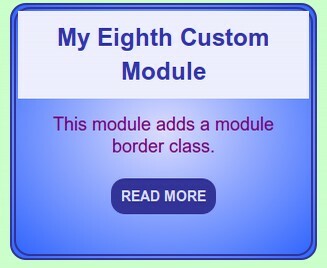 Creating preset Module classes gives us the most complete control over the appearance of our modules. However, the drawback of module classes is that it requires some knowledge of CSS if you want to create your own module classes rather than simply using the 20 preset module classes that come with our Rainbow template. There are a lot of people that simply do not have the time or interest to learn CSS and HTML. Nor should they have to. In the next section, we will review how to use our Rainbow template presets to style feature boxes for our Home page!